A Chinese composition doll with silk clothes circa 1900-20. 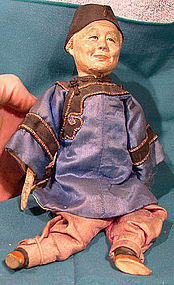 This 9-3/8" long vintage Chinese character doll has a composition head, hands and feet plus the original silk clothing. 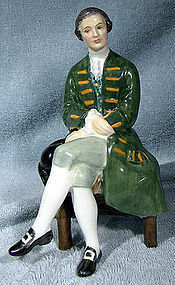 This doll features fine painting on the face and shoes; the costume has blue, purple and black real silk with gold trim and a black hat. It is in fair condition with no damage or repairs other than some crackling and losses to the paint on the hands and the head and some fading to the clothing - please see pictures for condition. All items are thoroughly and conservatively graded and all condition issues are noted; all items are vintage or antique and may have slight signs of gentle use. Tracked Packet shipping to anywhere in the U.S. is $15.50 - this includes online tracking, air service and insurance up to $70. Items paid with a credit card will be shipped to confirmed addresses only. We do ship internationally. All of our prices are in $US. PLEASE NOTE: We DO NOT accept PayPal.